When she came from last on the home turn in a field of 18 runners to win by almost 2 lengths, he knew he hadn’t had that feeling since the heady days of Sunline. Two weeks later Winx was the furthest thing from Larry’s mind, as he jumped off a horse at Doomben, and felt a strange sensation in his right knee. He’d had niggling knee problems for some years, but chose to keep riding and manage the discomfort as best he could. He fulfilled three commitments at the next metro meeting, but later experienced acute pain, and excessive swelling in the right knee. A visit to a specialist, and an extensive examination confirmed his worst fears. Larry was suffering from severe meniscal tears in both knees - damage to the rubbery cartilage that cushions the shin bone from the thigh bone. There’s no worse affliction for a jockey, because the condition is aggravated by any twisting or rotation of the knee. There was no easy way for specialists to inform the jockey, that a long rest from race riding was necessary, and that he had to spend as much time “off his feet” as possible. As the months wore on, the normally hyperactive Larry Cassidy, was restricted to many hours just sitting around with his feet up. He tried a comeback a few months later, but had to stop when he sustained stress fractures in the tibia and fibula of both legs, a development specialists couldn’t explain. More months of total inactivity, then another aborted comeback. “I was never diagnosed with depression, but looking back now I have no doubt I was suffering from the condition”, recalled the likeable jockey. “Every time I visited the Doctor, he told me I simply needed more time. The boredom levels soared, and so did my weight. I got to 68kgs, and felt awful. When I’m riding I like to exercise between race meetings. Doing nothing was driving me crazy”. After almost 18 months, Larry made a decision that was fraught with danger. “I decided to start a jogging routine, knowing it was going to hurt like hell. I felt the meniscal tears should have repaired to a large degree, and it was time to find out”, said the jockey. Even though he started out very quietly, the pain was acute, and he was resigned to defeat. As the days wore on there was a subtle improvement, and two weeks later he was striding out pretty freely. A few more weeks, and he was pulling up with little or no pain. “I’m not saying that method would work for everybody, but it certainly worked for me, and the weight just fell off me”, recalled Cassidy. “When I got down to 59kgs, I decided to return to trackwork at Eagle Farm where Chris Munce let me canter one around quietly. By the time I got back to the scraping sheds, my legs were like jelly. A jockey bears all the strain on his legs, and the long absence had left me with no lower body strength. I persisted, and within a month I was riding 5 or 6 horses a morning”. Larry is extremely grateful to trainers like Brian Smith, Rob Heathcote, Brian Wakefield and Lorraine Erhart for their support in the early days of his comeback. The special horse to provide Larry with his first win back was the Brian Smith trained Sony Legend at Doomben almost two years ago. Just recently he posted his 100th win, since returning to the saddle. It’s been quite a journey for the Wellington born horseman, whose career was inspired by the achievements of his jockey brothers. Ricky Cassidy was always heavy, but carved out a notable career as a jumps jockey in NZ. Jimmy retired in 2015, with one of the most distinguished records in Australasian racing history. Larry was originally apprenticed to Brent Beattie at Palmerston North, and had his first race ride on an old jumper at his home track of Trentham, finishing with the also rans. Rhythm Lass at Otaki was his very first winner, and one of 54 winners he rode during his time with Beattie. His indentures were later transferred to Bruce Marsh at Woodville, and the winners started to flow. He rode 50 winners in his first year with Marsh, and 100 in the second. It was Bruce Marsh who introduced Larry Cassidy to Australian racing in 1991, campaigning horses in Brisbane, Perth and Sydney. Larry was one of five jockeys to fall in a nasty incident during the AJC Autumn carnival, but that didn’t deter his enthusiasm for Sydney racing, and he knew he’d be back sooner rather than later. He arrived unheralded and unsung in the Spring, and immediately threw himself into riding trackwork, at Randwick, which attracted the attention of trainers like Tommy Smith, Bill Mitchell and Bart Cummings. Brother Jim had been riding a smart three year old called Coronation Day for the late Max Lees, but couldn’t make 49.5kgs for the George Main Stakes. He persuaded Max to give his kid brother an opportunity, and Larry did the job perfectly to win a Group 1 just weeks after arriving in Sydney. The handsome Coronation Day went amiss after winning 5 races from only 12 starts, and had to be retired. Of all his 42 Group 1 winners, the predictable favourite is Sunline, that arrogant, self-assured racing machine, who posted 32 wins and 12 placings for 11.3 million dollars all those years ago. Larry won 6 races on the mighty mare, including the Spring 3 year old grand slam of Furious Stakes, Tea Rose Stakes and Flight Stakes in 1998. With only 52kgs she looked a good thing in the 1999 Doncaster, and led most of the way to score a dominant win. “It was a privilege to have eleven rides on one of the greatest mares to ever race in this part of the world”, recalls Larry. He had won the Doncaster two years earlier on the Waterhouse trained Secret Savings, a horse he rates very highly among the best he’s ridden. 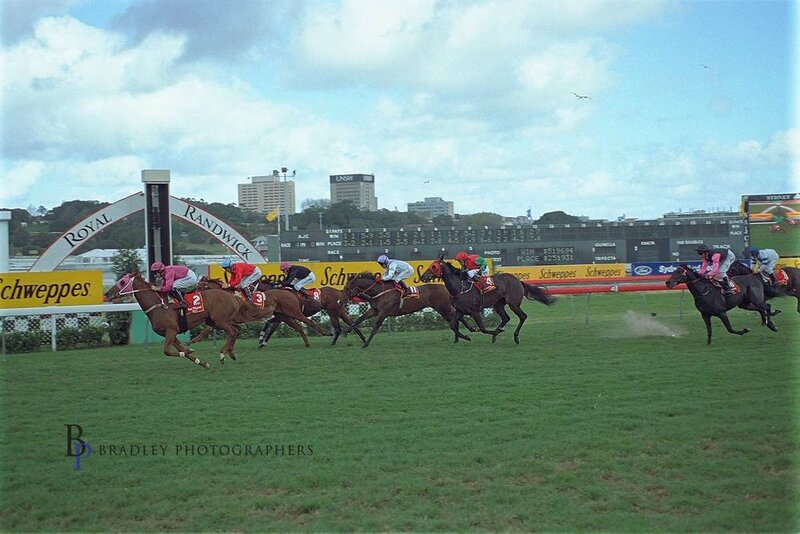 He loved Linesman, a free running stayer who gave him an effortless Sydney Cup win in 1997. Linesman won the Chairman’s Hcp by nearly 4 lengths, and dropped 4kgs in the Cup. “I honestly thought he was a good thing, and rode him accordingly. He led and won by almost 6 lengths”, reflected the jockey. Larry believes the same horse should have finished closer than 5th in the 1997 Melbourne Cup, when he was only 1.2 lengths behind Might And Power.” He was troubled by foot soreness in Melbourne, and was a little below his best on the day”, said Cassidy last week. He says he’s had 13 or 14 rides in the Melbourne Cup with a third on Oompala (1994), and a fourth on Na Botto (1990), his best results. He was delighted to win the prestigious Victoria Derby of 1998 on Arena, for the Inghams and John Hawkes. “You couldn’t believe the run I had in that Derby”, recalls Larry. “I was near the tail turning for home, where everything left the fence. I sailed straight through along the rail, and only had to pull around the leader. You rarely get that kind of luck”. Just glancing at Larry’s Group 1 list I spotted Carnegie Express (Rosehill Guineas), Lotteria (Myer Classic), Desert War (Epsom Hcp and Chipping Norton Stakes), Golden Sword (Epsom Hcp), Yippyio (Brisbane Cup), Portland Singa (Brisbane Cup), Dodge (Epsom Hcp and Queensland Derby), Juggler ( Chipping Norton Stakes), March Hare (George Main Stakes) and AJC Derby (Ivory’s Irish), and that’s only half of them. Larry still laments the premature demise of the brilliant filly Unworldly, who had to be put down after a track accident at Warwick Farm in 2000. She won 5 from 6, including the big treble Sunline completed two years earlier - Furious Stakes, Tea Rose Stakes and Flight Stakes. The jockey has no doubt Unworldly was heading for the big time. When Darren Beadman quit racing to become a Minister of religion in 1997, Larry Cassidy was appointed stable jockey for Jack and Bob Ingham’s Crown Lodge operation at Warwick Farm. The opportunities that came his way over the next few seasons enabled him to win three Sydney riding premierships. “I’ll always be grateful for the wonderful opportunities I received during that period”, reflected Larry last week. “I’m the first to admit I slaughtered a few over those three seasons, and John Hawkes gave me the appropriate blast on each occasion”. Larry, and Michelle his wife of 22 years, decided on a move to Brisbane nine years ago. “The riding ranks in Sydney were just so powerful, and I could see my opportunities would no longer be what they were in the Crown Lodge days”, said Cassidy. “Michelle has family in Brisbane, and it made good sense to give it a try”. Larry and Michelle are extremely proud of their two children, who are loving the life in Queensland. Luke (21) has already obtained his degree in Biomedical Science, and is currently doing his honours degree. Jade (15) seems to be interested in the Arts, and Larry is tipping a future somewhere in the entertainment world for his daughter. At 48 years of age, Larry hopes to be plying his trade for another 5 years, which would mean a retirement age similar to that of his famous brother Jim. He’s currently riding at 54kgs, and at the time of writing his troublesome knees are behaving themselves. Suspension kept him away from the races on Saturday (August 18th), but he still attended trackwork and put 9 horses through their paces. It’s been a long time since young L.V. Cassidy rode that old jumper in a flat race at Trentham, to announce his debut as a professional jockey. He had no way of knowing that by 2018, he would have accumulated a huge tally of 2700 winners, which compares favourably with the records of his three role models brother Jim Cassidy, Damien Oliver, and Mick Dittman. A Melbourne Cup and a Golden Slipper would go down well, but what the heck! His record reads pretty well as it is, and don’t forget he has won a race on Winx.